According to the U.S. Energy Department, the average household in the United States spends approximately 6% of its annual energy use on cooling. In fact, it costs U.S. homeowners a whopping total of $11B every year to power their air conditioners. That’s a lot of A/C – and a lot of money! If you’re looking to save on your cooling costs this summer, here are a few easy ideas you can put to use in your home. Use fans – Whenever possible, use fans instead of air conditioning. Purchase a portable pedestal or floor fan that can be easily adjusted. A fan that blows directly on you can make you feel up to 4 degrees cooler. For some extra refreshing coolness, fill a bowl with ice and place it in front of the fan. The fan will blow cooler air as the ice evaporates. A ceiling fan also offers a great economical way to cool down, but it needs to be running in the correct direction. Make sure that the air is blowing down, not up (like you may have had it running in the winter). Keep it clean – An inefficient air conditioner can waste energy and money. One of the easiest ways to maintain your air conditioner’s efficiency is by keeping the air filter clean. The Energy Department estimates that an A/C’s energy consumption could be lowered by 5% to 15% simply by replacing a clogged and dirty filter with a clean one. How often you should clean or replace a filter depends on the type of filter you have. It is recommended that you change pleated filters every three months. HEPA filters should be changed every month. You may also want to consider getting an annual air conditioner tune-up to ensure that your unit is performing as it should and to diagnose any problems that could be affecting its efficiency. Choose a good A/C location – An air conditioner that is located in direct sunlight uses more energy since it has to work harder. If possible, locate your air conditioner units on the north, east, or the most-shaded side of your home. Make the CFL switch – Are you still using incandescent light bulbs? Compact fluorescent (CFL) bulbs use less energy and create less heat than incandescent bulbs. Less heat means your A/C system needs to work less to cool your home. Plus, CFL bulbs last longer so they will need to be replaced less often. Let the fresh air in…at night – Opening windows on a really hot day can actually make the inside of your house warmer. Instead, try keeping the windows open at night, especially on evenings when the air is cooler outside than inside. If you have two windows on opposite sides of a room, keep them both open for breezy cross ventilation, or use box window fans in the windows to create a cooling “wind tunnel” effect. In the early morning, shut all the windows, blinds, curtains, and shades. This will help trap the cooler air in your home and keep sunlight from heating up the room. Watch the oven use – Turning on your oven during the day can really turn up your overall cooling costs. It heats up the rooms in your home causing your A/C to use more energy. In the summer, try to use heat-generating appliances such as the oven, clothes dryer, or dishwasher at night or in the early morning when outside temps are cooler. You can also use your microwave or outside barbecue grill for cooking. 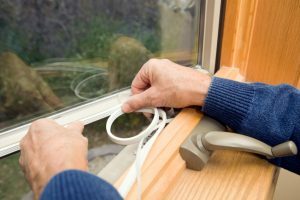 Lose the leaks – Air leakage around windows and doors can contribute to just as many problems in the summer as it can in the winter. In the summer, leaks allow air-conditioned air out of your home and heat and humidity in. This can significantly increase your A/C usage and your discomfort. Stop the leaks by caulking and weather stripping cracks around doors and window frames. Dehumidify – When the humidity is high, but the temperature isn’t, a dehumidifier is a good way to help you feel more comfortable. On days when both the temperature and humidity are high, running a dehumidifier and an air conditioner at the same time can be a smart idea. Humid air takes more energy to cool, so when a dehumidifier is running in a room that also has a running A/C, the air conditioner has to a lot work less. Even though the dehumidifier does use electricity, it uses a lot less than an air conditioner and can reduce your cooling costs in the long run. You also decrease wear and tear on your air conditioner meaning it may last longer and need fewer repairs. Control the cooling – Lower the thermostat setting on your air conditioning system to 78 degrees when you are at home, but raise it at night or when you are leaving the house. Or purchase a programmable thermostat that will do the work for you. Give your A/C breathing room – Be sure that nothing is obstructing your air conditioner unit that could be impeding its airflow. Check for weeds and leaves around an outdoor unit, and furniture that could be blocking any indoor vents. An air conditioner that is free from obstructions will work better and more efficiently. For more interesting facts about home cooling see this Energy Saver 101 Infographic.